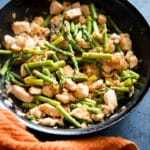 Tender and sweet sprigs of fresh asparagus are a wonderful vegetable to add to a quick and easy chicken stir fry recipe. 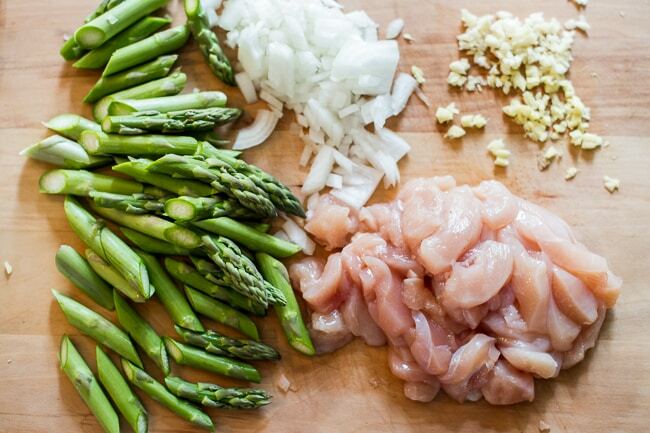 It only takes a few ingredients to make a healthy chicken stir fry with a vegetable that everyone in your family enjoys. 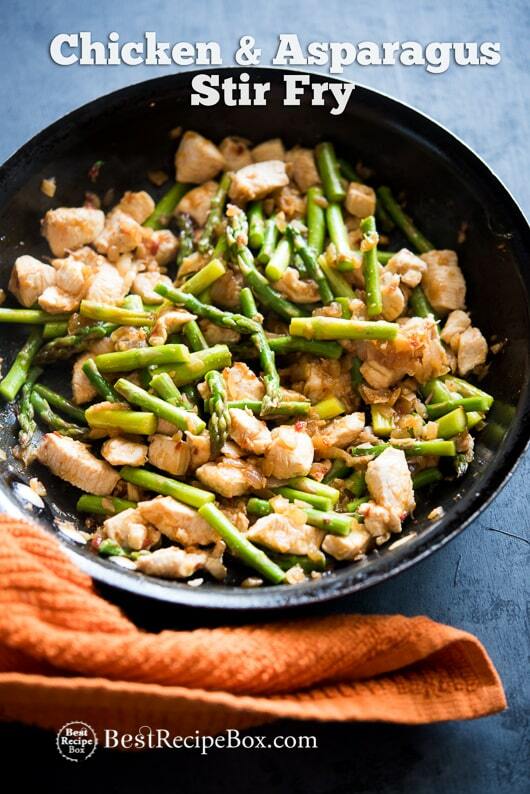 Though this recipe calls for asparagus, you can replace or add any other vegetable that you like. The most important thing is that everyone is eating their vegetables. Asparagus is a fantastic vegetable, especially in Spring time when it becomes plentiful. Tis the season now when asparagus is at it’s peak in the grocery stores and all the farmers markets. The sauce in this chicken stir fry has a nice kick of hot sauce and if you’re a sriracha hot sauce fan, you’ll love this chicken stir fry recipe even more because of the nice tangy/sweet and spicy combination that sriracha brings. This quick chicken stir fry can be made with either boneless skinless chicken breast or chicken thighs and you can serve this stir fry with rice or pasta. What ever you decide to you, don’t be afraid to add extra asparagus because the wonderful, tender taste of these sprigs are fantastic. It’s hard to not love chicken stir fries. This recipe was originally published in 2013 and re-published in 2017 with a new video and photos! Please read recipe post for more recipe details. Adapted from Healthy Chicken and Broccoli Stir Fry. Wash and trim tough ends of asparagus. Cut asparagus into about 1” pieces. Set aside. Heat large pan over medium-high heat, then add oil. Add garlic, minced ginger and onions and cook until translucent. Add chicken and cook until the chicken is lightly browned. Add soy sauce, hot sauce and vinegar. Stir sauces into chicken and continue cooking the chicken until it’s nearly cooked through. 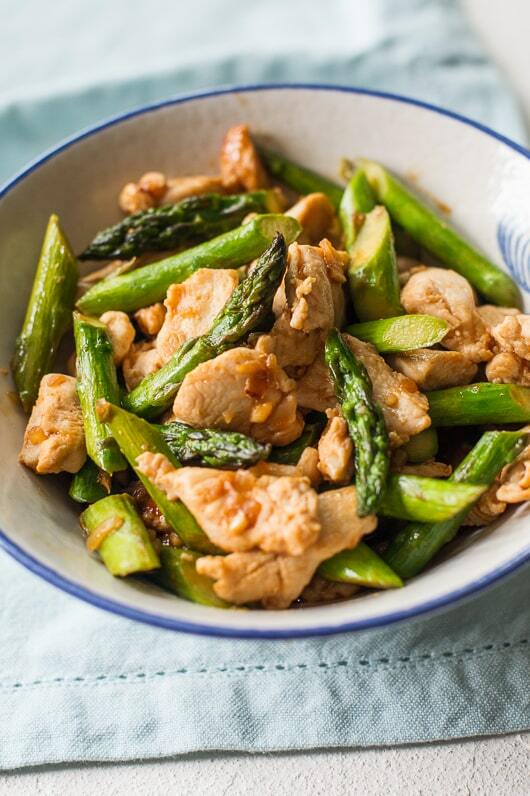 Add asparagus tips and cook for 1-2 minutes, or until asparagus is tender and chicken chicken is completely cooked. Serve warm with rice or pasta. This is one of my staples. We don’t really love Sriracha in my house, so we replace this with Sambal, otherwise this is awesome! Hi John, Sambal sounds like a fabulous alternative. Great idea!